I will be working mornings that week, so I'll be able to grind. I'm worried that they'll do something silly and put episode 5 during tankfest. Edit - and join the WJDE shared channel or report to rusty's dungeon for some fish-based corrective treatment!!! Edit 2 (love an edit) - missed the first 2 seasons of Frontline. Can someone explain why I should play this one? What makes it worthwhile please? Thanks! Edited by krazypenguin, 04 April 2019 - 03:40 PM. Vs the first run we had a year ago? Map has changed a bit. As in C is now easier to defend. And A is way easier to cap fast due to all the extra cover. Objective turrets have shifted a bit with some cover. But due to other gaps. The lights, tracked or wheeled will make it to the Objectives the far side first and take them out, vs the one they pushed up to. So for the most part, it's mostly the same, with slightly worse in a few aspects. But... rewards are not to bad. Nor is the income, XP and crew training you can do. As if you get General. Getting 3 to 5K XP on one tank you did lots in is not uncommon. There are 4 tanks that you can choose from. STA, WZ 111, Emil 1951 and Secret T IX. Plus the credit income is about 30% better than randoms. If none of these matters to you then don't play it. Doing the same thing over and over again while on the same map is going to bore the hell out of anyone. They had all this time, why didn't they design a new map? And the attacking side is way too powerful. Defending is only possible if the attacking team is made of bots. Only thing that is playable in FL. It'll be tough to get Amx 65t by that time. But hey, maybe next FL! I got stock Udes and Lorraine though waiting for some lovin'. still playing arty but running away driving around those vast expanses as fast as a light tank. No full gold? You disappoint me.. Strange, someone I know used to do the opposite when "Dinger-posting". Anyway, spamming gold in the T95E2 makes a lot of sense - the HEAT shell has a very usable shell velocity. Oh, and as for on-topic... it's a fun mode, if quite linear. Definitely has potential. Doing the same thing over and over again while on the same map is going to bore the hell out of anyone. They had all this time, why didn't they design a new map? And the attacking side is way too powerful. Defending is only possible if the attacking team is made of bots. They're atleast going to design another map for it, but yeah, it seriously should've had the second map at the start of the second season rather than only just realising that after it started. And have they said, when that map will arrive? FL and the current map was originally not done by WG. It's was by an independent 3rd party studio in Austria "Bongfish", that also did Grand Battles. And the map for them. At least it was back when WG did not have time due to the HD maps etc. The WG and WOT logo and info is still on their portal so I suspect they still are doing it. If so, it's up to them when that map gets done. Edited by Balc0ra, 04 April 2019 - 10:49 PM. 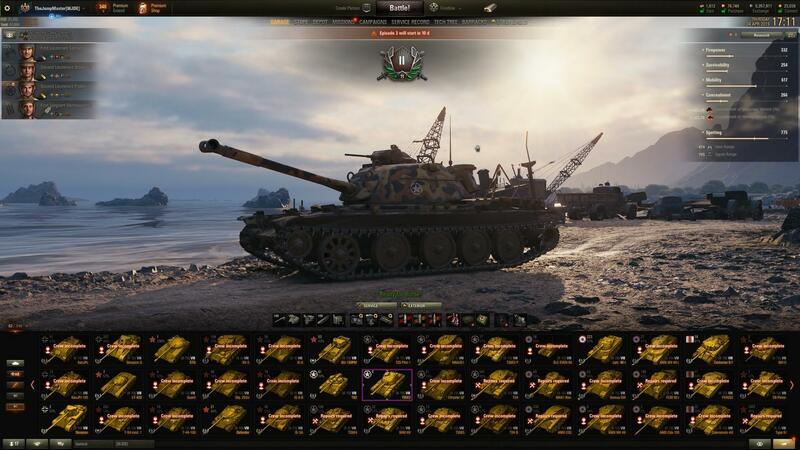 do you also feel that marks are very hard to grind in T95E2 ? Nerf the power artillery got in the matches, and all the lights needs to have at least one of their "suppy" (can't remember what it's called) slots removed. Edited by Kalonianhydra, 10 April 2019 - 06:15 PM.